"It was very difficult to see anything once the curfew went into effect last night," an Amnesty staffer says. Protesters after the midnight curfew in Ferguson, Missouri, on Aug. 17, 2014. WASHINGTON — Amnesty International has taken "unprecedented" action to deal with the situation in Ferguson, Missouri, by sending resources the human rights group has never before deployed inside the United States. The organization has been on the ground in Ferguson since Thursday. It sent a 13-person human rights delegation to the city in the wake of the Aug. 9 police shooting death of Michael Brown. 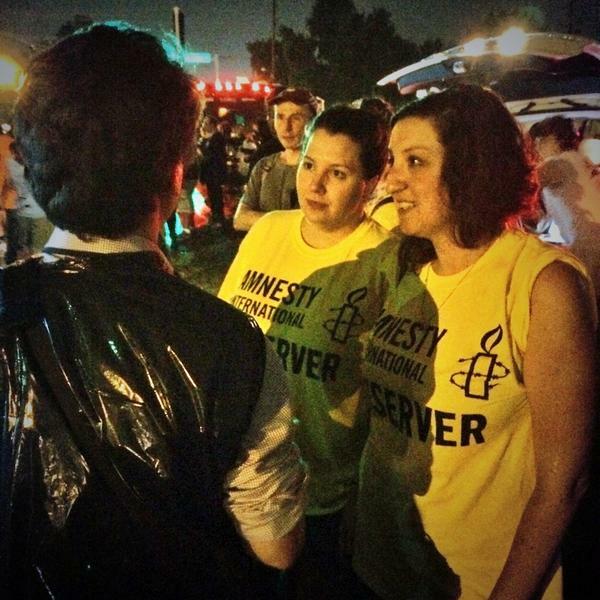 Jasmine Heiss, a senior campaigner with Amnesty and part of the team in Ferguson, said the use of the "cross-functional team" — which she said included community trainers, researchers, and human rights observers — was "unprecedented" within the U.S. for the group. On Saturday, after Missouri Gov. Jay Nixon declared a state of emergency and put a curfew in place in Ferguson, Amnesty International USA's executive director, Steven W. Hawkins, issued a scathing statement. "We criticize dictators for quelling dissent and silencing protestors with tactics like curfews, we'll certainly speak out when it's happening in our own backyard," he said. "The people of Ferguson have the right to protest peacefully the lack of accountability for Michael Brown's shooting." In an interview Sunday afternoon, Heiss said because of limits police placed on Amnesty's access, "It was very difficult to see anything once the curfew went into effect last night." It was "impossible," she said, for Amnesty to make any sort of judgment about whether actions taken by the police after the midnight curfew went into effect were proportional or necessary. She called it emblematic of "the overall lack of transparency in this investigation." Heiss noted the group's long focus on criminal justice, including the use of excessive force, in the U.S. The group's Rights for All effort in 1998, which included follow-up proposals for change in 1999, preceded specific investigations into the Los Angeles and Chicago police operations. In terms of specific cases, she noted that the group called for similar action by officials after the killing of Trayvon Martin in Florida. The group there, she said, had called for a "thorough, impartial, swift investigation — with transparency," emphasizing that a key tenet of that is "the family is kept informed" about the investigation. • A prompt, thorough, independent, and impartial investigation into the shooting of Brown must take place. Brown's family must be kept informed throughout the investigation. Under international law, police officers suspected of having committed unlawful acts must be held to account through effective investigation, and where warranted, prosecuted. • All police departments involved in policing the ongoing protests in Ferguson in response to Brown's death must act in accordance with international human rights standards. Any human rights abuses in connection with the policing of protests must be independently and impartially investigated, and those responsible held accountable. • A thorough review of all trainings, policies, and procedures with regards to the use of force and the policing of protests should be undertaken.